Looking for #healthy Halloween snacks for kids? We all know that Halloween Trick or Treats mean tons of candy and loads of sugar. But we don’t want our kids to be on a “sugar high” for hours after all the fun gathering their loot. Here are healthy alternatives for Halloween snacks and treats which you can serve up at your party or as Trick or Treat loot. 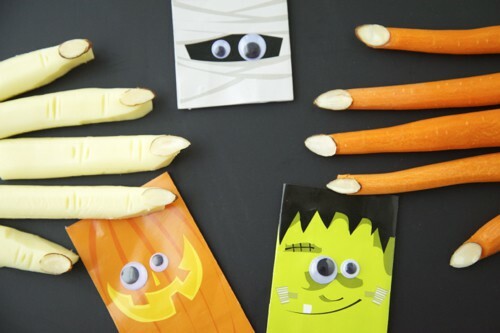 These are easy to make and will surely be a hit with the kids. Eating carrot finger, apple mummies, Jack O’Lantern fruit cups and kiwi Frankensteins is much more fun than plain old candy. Who says treats need to be all sugar and candy? Halloween is one big sugar fest, from school carnivals and parties to the Big Night itself. If all the sweets are making you go a bit batty, you’re not alone! Check out our picks for healthy options that will have your little goblins grubbing on the good stuff.